These texts are a selection of writings that expose the philosophical underpinnings of work created at the time they were written. 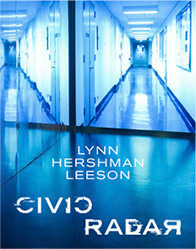 Civic Radar presents the first comprehensive overview of Lynn Hershman Leeson’s work. Edited by Peter Weibel, with contributions from thirteen renowned authors including Andreas Beitin, Pamela Lee, Laura Poitras, Ruby Rich, Jeffrey Schnapp, Kyle Stephan, Kristine Stiles, Ingeborg Reichle, and Tilda Swinton.